This is my first time doing a Game Jam ever. 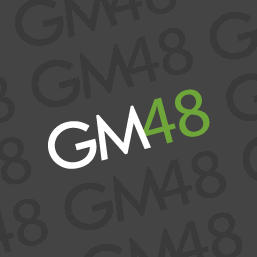 I've been using GM:S for about 6 months now as a hobby. I did the game jam alone and all the coding and assets/sprites were all made in the 48 hours period except for the music which came from royalty-free website (credit below). I wanted to make a psychedelic game about the current theme. Unfortunatly doing a 48 hours Game Jam was way more difficult than I tought. I had so many ideas but so little time. Hope you will still love the game! I liked most of the ideas. The two different trips were fascinating and they felt trippy and unexpected. Especially the red color, which took a surprisingly creepy turn. The whole execution however lacks polish and it feels rushed in several ways. Mostly because there doesn't seem to be a reason behind any of it. I do think the pacing is strange, on the unsatisfying part. Some elements are slow or not quite believable (the clock has the minutes spinning too slowly in relation to the hours; the rain falls too slowly) The first day is reasonable as you get introduced to your world. The second day felt unnecessary. We get pretty quickly that it's a monotonous life, so it would have been nice to have something different to see in the second day. Perhaps some foreshadowing with barely noticeable elements that hide/run away as you see them. Just to build it up a bit more instead of repeating the first day. In any case, it felt like what happened was sudden, not properly "plotified". Like, you just randomly happen to find a color without any clear reason. I liked however the transitions between the different "chapters" and how unpredictable they were. The bird hair. The improvised floating gameplay. The turning back tor reality with your body on the ground and the rain. I love that you brought some consistency with the character having "eye pockets" (don't know how we call that in english, but like, when you didn't sleep much). All of this sets an interesting world to discover! Hey! Thank you so much for your critic! Feedback is a really good way to improve! I must admit that I dit rush the game on some part and didn't think twice if a lot of aspect! I would have loved to have some more time to make the art better, had more story plot or gameplay! Immersive game, it could have had some more gameplay, but I know that the story was more of a focus. I don't like jumpscares tough, it's cheap horror in my opinion, but the thing that happend when you ate the red color that was really cool. Try to make more in that direction, it could go really well :D.
Hey thank you so much for playing the game! The game was quite enjoyable and got me to play through the whole thing. The graphics were alright i guess. The proportions were a little weird like the toilet and bed itself. This was powerful, emotive storytelling, with subtle markers that create highly immersive environments. The story is told without any dialogue, and little things and minor, gradual changes are what really builds this one up. I echo peoples love for the down in the rain scene, that got me good. The ending was good enough for a short game, but I can see this going so much further. The pacing is good, the diversity, the art, everything about this oozes creativity, and I really enjoyed the experience. Great work on this! It seems like every jam one game goes above and beyond in developing a real atmosphere, and you might be the one for this jam. It's great to hear it's the first time you've participated in a jam. Great start and good luck in the future! Hey thank you so much for your feedback! I did try to compensate my lack of coding skill with the atmosphere ahah! Thank you again for taking the time to play my game and leave a feedback =) Really appreciate it! I'm not a huge fan of jump scares, but I guess it comes with the territory and I did appreciate the shifts in atmosphere throughout. Hey thank you so much for the review! Unfortunatly the Jump scare was put there because of lack of time. I had several ideas for multiple ending but 48 hours is wasn't enough! Great job! I really loved the narrative behind the piece and definitely agree with everyone when I say I really want to see more. I want to see what those ideas you had were and where they'd show up here. I think I'm just echoing other feedback by saying the repeat days are a little boring. I wonder what other more interesting ways of portraying an everyday "this is a boring life" there are. And that's not to say it was ineffective, it's more that the every day repeats is a bit of a trope. What if instead of pacing it differently, you showed a calendar beside the clock that just went through a whole week as the clock spun. Maybe the drug trips happen on the weekend? The best moment of the narrative is when the player is a crumpled mess in the rain. It's unexpected because I did really get wrapped up in the fanciful "everything is cute" and expected to go further down that path. Great job catching me off guard in a very engaging way. This was fun. Hey thank you so much for your constructif feedback! You have really great idea to improve the game! If I ever expand the current game be sure I will look into the calendar, I really like the idea! Thank you so much for trying the game and putting time in the feedback! This is reallt good information for me to improve. Thank you so much! Really awesome game! It's very original and I love the philosophy behind it. I wasn't able to expect what was about to happen so great job man! Wow, this is certainly the most... unique submission so far. It's a treat to play through, the art is fantastic and incorporates the theme which I enjoy. While the game is simple in terms of movement etc the strange and surreal story keeps you hooked and wanting to get to the end. It's a crying shame that you have used music that's not in the rules sadly and it does add ALOT to the game, which makes me feel conflicted, this is obviously my biggest criticism. I think the repetition at the beginning is to show you his life and how boring it is in black and white, so I understand it's on purpose, but found the walking a bit slow having to do it over and over. I was also confused, as when you do something like eat a color, it's not immediately obvious what you are meant to do after that, as there is no subtle change, until a while later(15-20 secs?) when the color kicks in, this I'd change it to sooner. Overall I really enjoyed this and feel there should be a lot more eyes on this, for only 6 months dabbling in game maker, very impressive! Making the game more fast pace would also be a idea (replaying it now I feel like player won't make it to the first color considering the 2 first day is kinda boring! Would try to change that). Jesus christ. Kickstart this game. Make it a full game. Do it. DO it NOW. This deserves more attention. Good job. Nice little stoy about why you shouldn't eat things from the floor. Hey thanks for playing the game! It is a perfect way to describe it ahaha! This is a pretty darn good (albeit surreal and weird) experience overall. In the part where you collect the bubbles, they don't seem to collide with the player very easily. Otherwise, very nicely done! Thank you very much for your feedback =D I still have a long way ahead to make decent coding ahah!